President ~ Hopkins and Sons, Inc.
Moving from one location to another has long been known as one of the top 3 most stressful situations that can occur in a lifetime (death of a loved one and divorce are the other two). So to make your move go as smoothly as possible one must be careful and diligent in their mover selection. The items being moved are your prized possessions so select a mover that will treat them as their own. 1. Be sure to request an onsite/in home walk through and estimate. 2. Check the company’s reputation through the Better Business Bureau and Angie’s List. 3. Make sure the company is an active PRO-MOVER and AMSA (American Moving and Storage Association) member. 4. The company should be insured, performs background checks on all employees, trains and performs random drug tests on all employees. 1. What is the valuation coverage for my items while in transit? 2. Will glass shelves and table tops be packed? 3. Will my floors/stairs be protected? 4. If moving long distance ask what their quality scores are with their van line. Once you receive the estimate be certain that everything you discussed is included and in writing, including the valuation coverage. When looking for the right mover be sure to not only look for price but most importantly the quality and integrity of the company. The lowest price may not always be the best answer for the best professional move results. 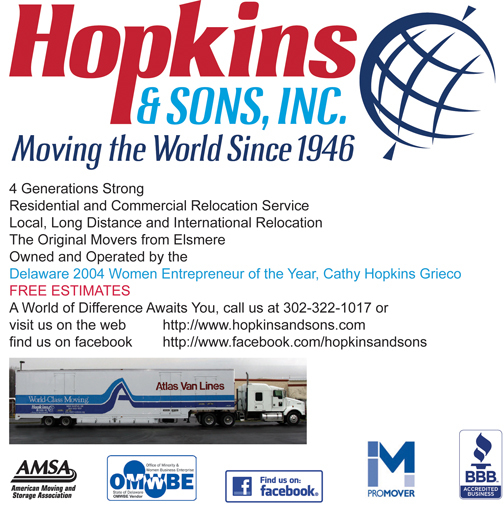 So if you are anticipating a relocation whether it be local, long distance or international, call Hopkins and Sons, Inc., a 4th generation moving company that has provided quality service since 1946.